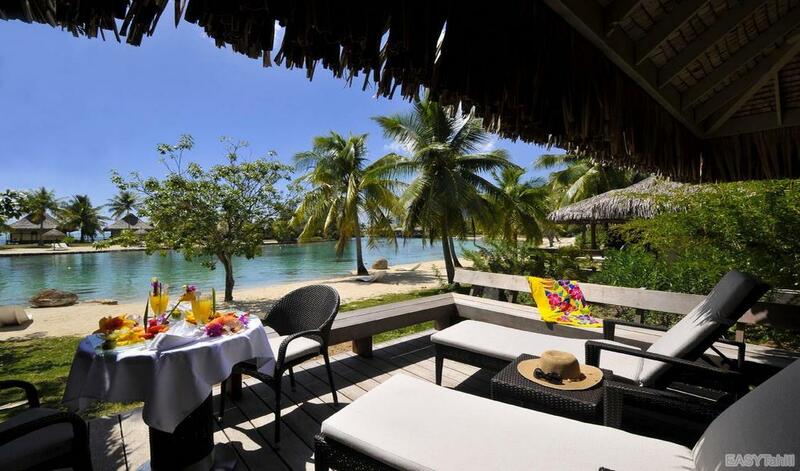 - Best price/quality ratio for a 4 star hotel in Moorea. 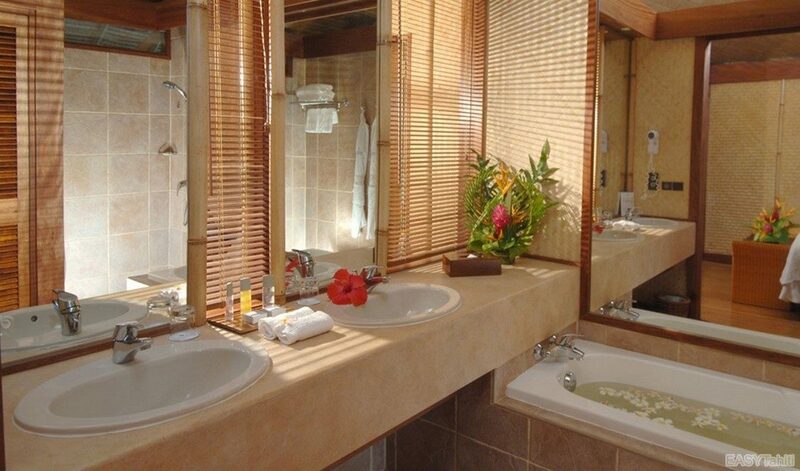 - Bungalow Garden offering the largest private pool of all hotels on the island. 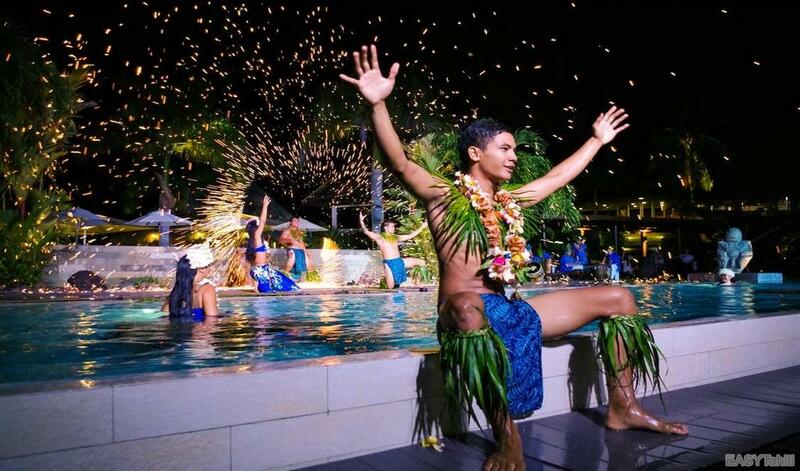 - Best seafood buffet and tahitian dance show (every Saturday night). - Unique activity center with Dolphins in Moorea. 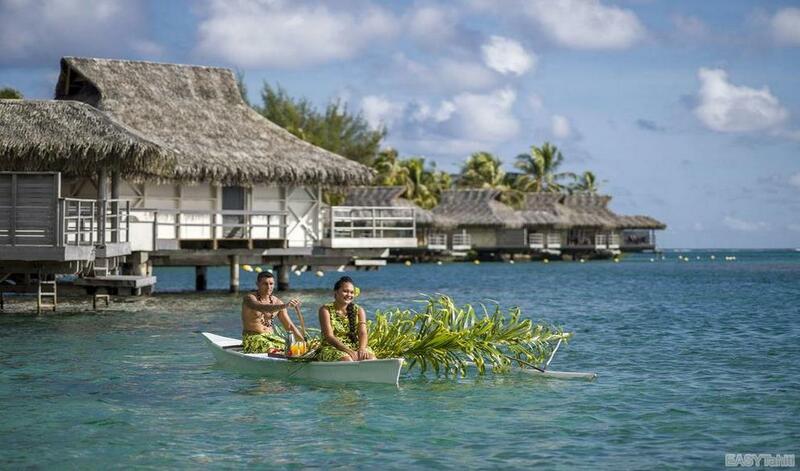 - 2 beautiful islands accessible by kayak from the hotel. Geographical location: NORTHWEST of the island, at the edge of the lagoon. 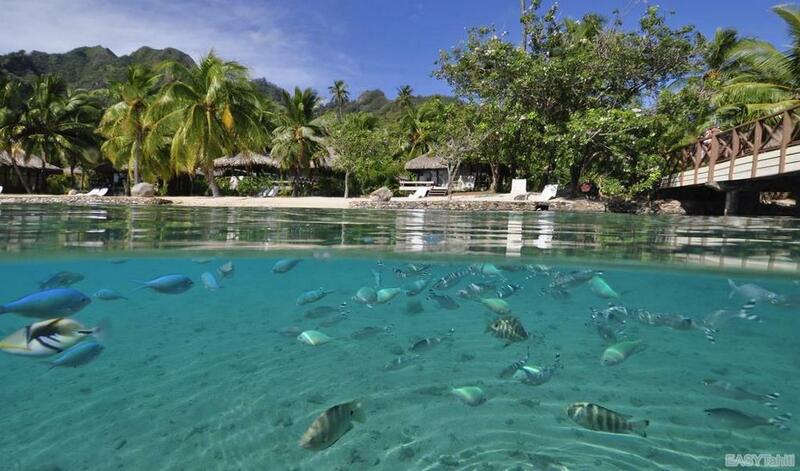 - 28.8 km from the Gare Maritime de Moorea (Ferry to Papeete). 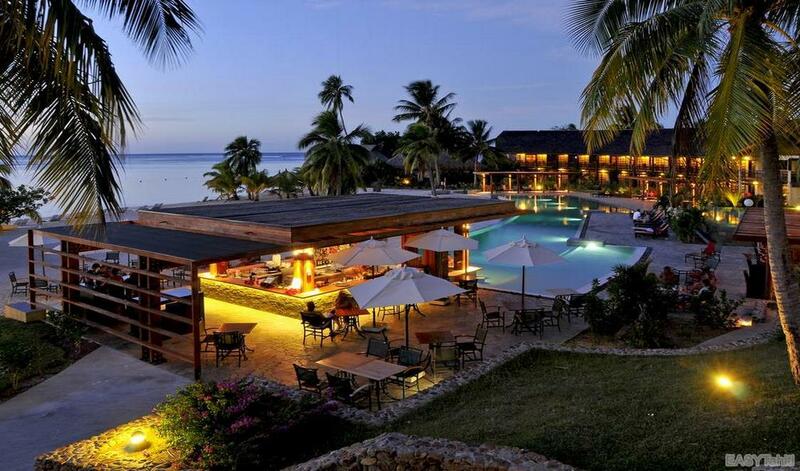 The hotel is set in a large tropical garden, with views of the lagoon, the garden and surrounding mountains. 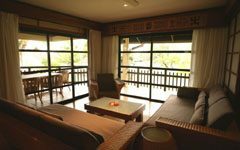 - 02 Lanai rooms accessible to people with reduced mobility. 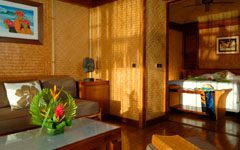 - 13 Lanai Premium Rooms. 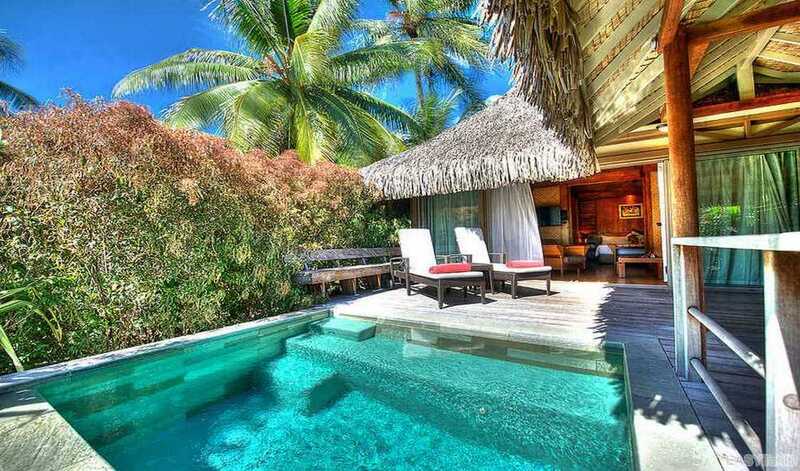 - 17 Junior Suite Beach Bungalows. 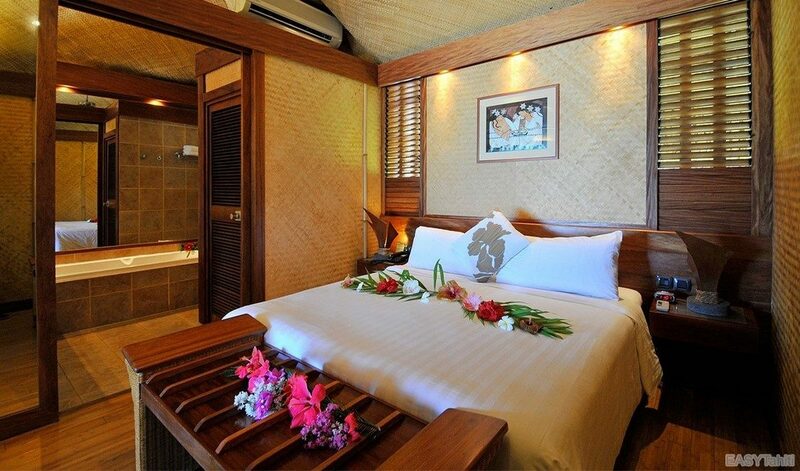 - 17 Garden Bungalows Junior Suite with private pool. 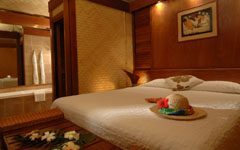 - 11 Junior Beach Suites Premium Suite. 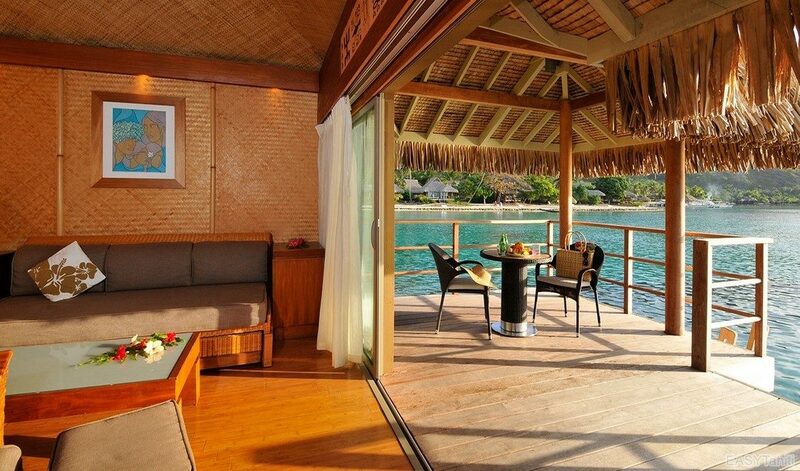 - 13 Overwater Bungalows Junior Suite ..
- 36 Overwater Bungalows Premium Suite Junior. - Family or Friends Stay: Some rooms may be communicating. 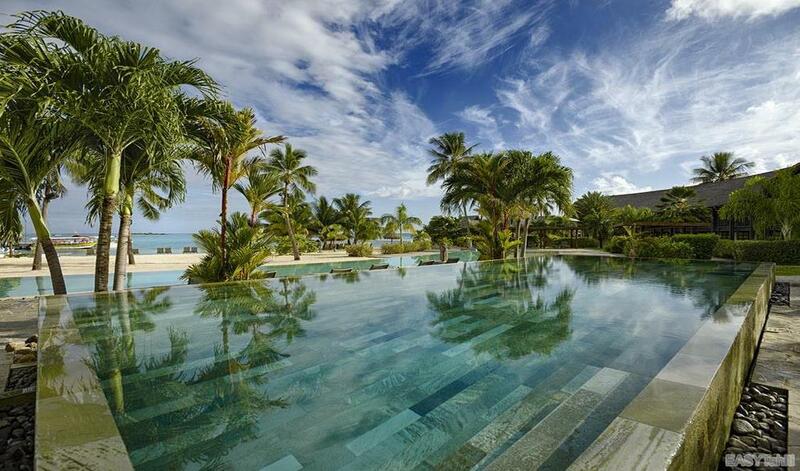 - Two infinity pools with sunbeds and umbrellas. - Marine Turtle Care Center. - Children under 4 years old are welcome at no extra charge in their parents' room / bungalow. - If capacity permits, children under 15 years old are allowed at no extra cost in their parent's room / bungalow. - Anyone from the age of 15 is considered an adult. - Children under 4 years can dine for free under the children's menu. 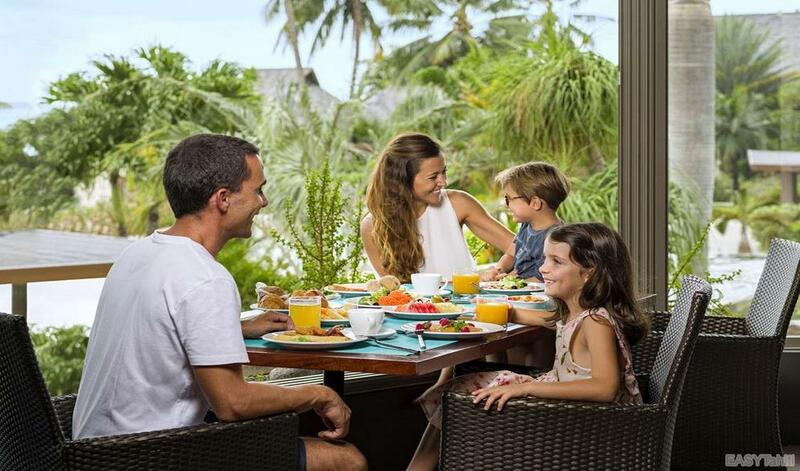 - Children from 4 to 11 years receive a 50% discount on meals. - Anyone over the age of 11 is considered an adult. - In the case of a group transfer (non-private), children under 12 years of age receive a 50% discount on the adult rate. If you wish to check in before 15:00, you can order an early check-in. If you wish to return your room after 11:00, you can order a late check-out. 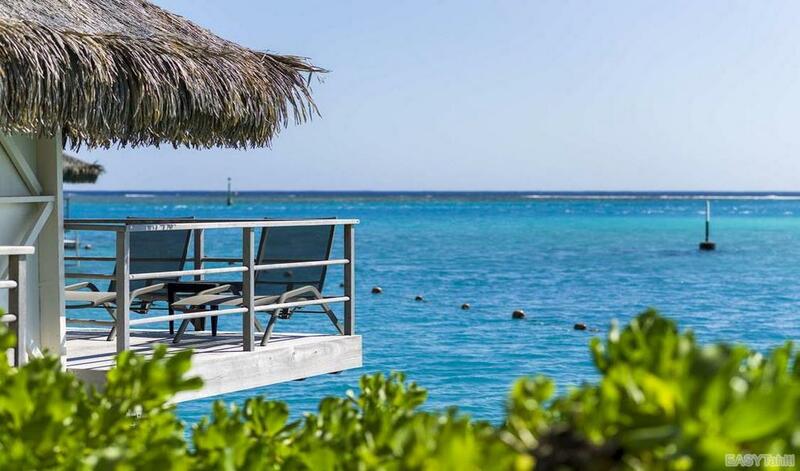 - Arrivals / Departures inter-island flights or ferry: Transfers between the airport or the ferry dock at Moorea and your accommodation will be organized by your EASYTahiti travel advisor according to your inter-island or ferry schedules. They will be operated by our transport company. - For your personal trips: The concierge can arrange a taxi service. * Note: We can also, through our transport company, organize your various transfers, according to your needs. 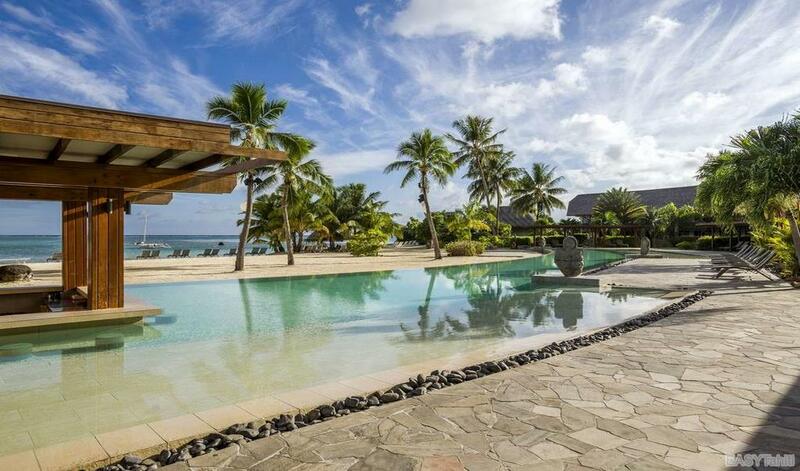 - Possibility to rent a car (sent directly to the hotel): Please contact your EASYTahiti travel advisor for more information. 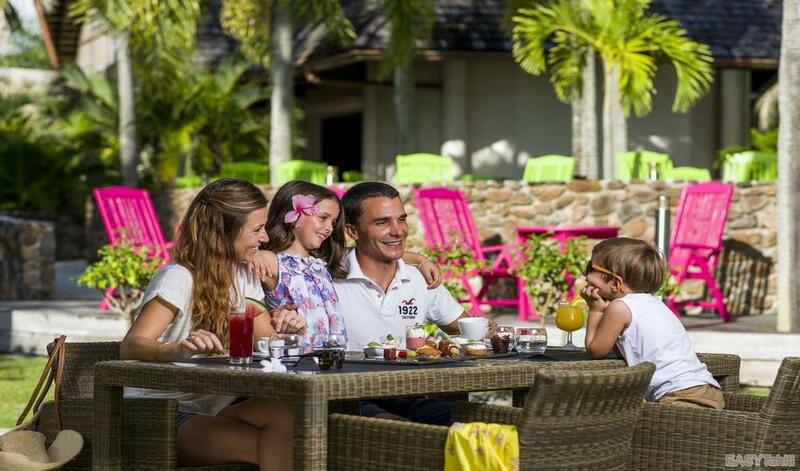 The gourmet restaurant "Fare Nui", open from 6:30am to 10:30am for breakfast, and from 7:00pm to 9:00pm for dinner, offers gourmet delights combined with the view of the ocean. It offers a unique experience and captures the magic of our islands. 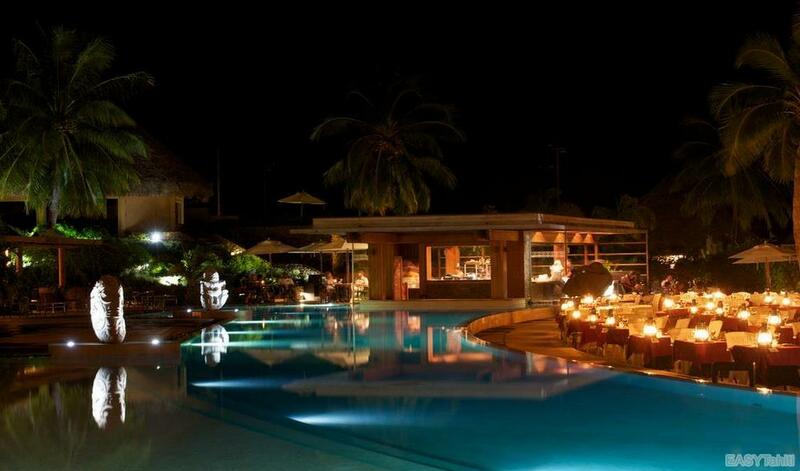 - Saturday: "Wonderful evening": buffet of seafood and grilled meat. 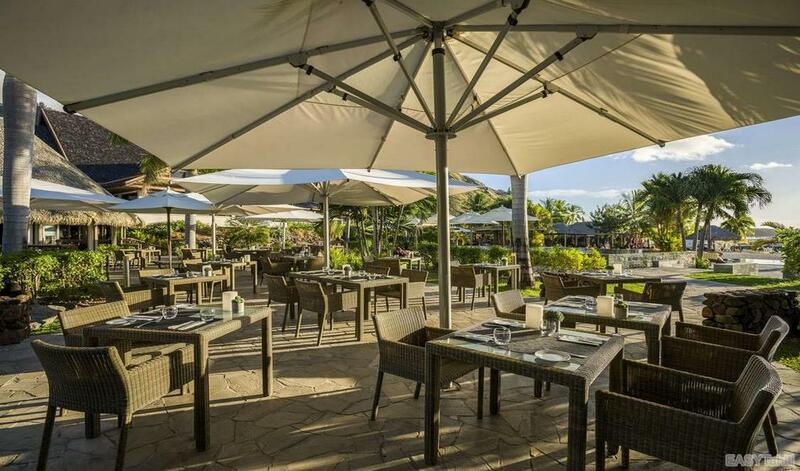 The restaurant "Fare Hana", located by the pool, serves throughout the day a light and varied menu for all hungers. Open from 11:30am to 9:30pm. 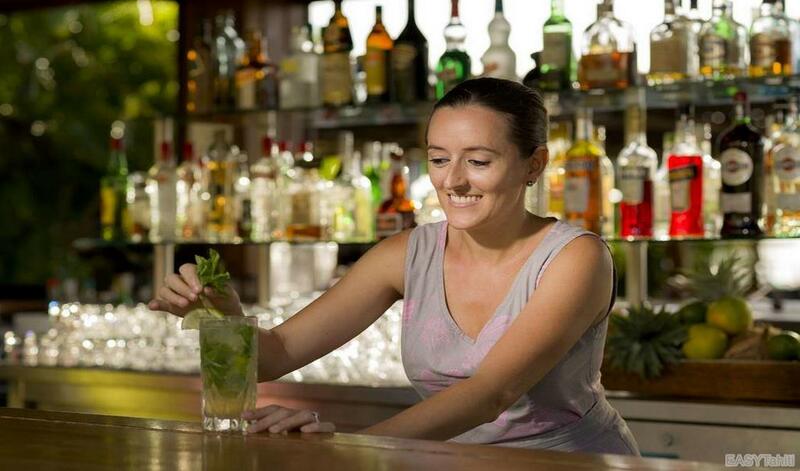 The bar "Motu Iti" and its terrace at sunset is a friendly space open from 10:30am to 10:00pm. 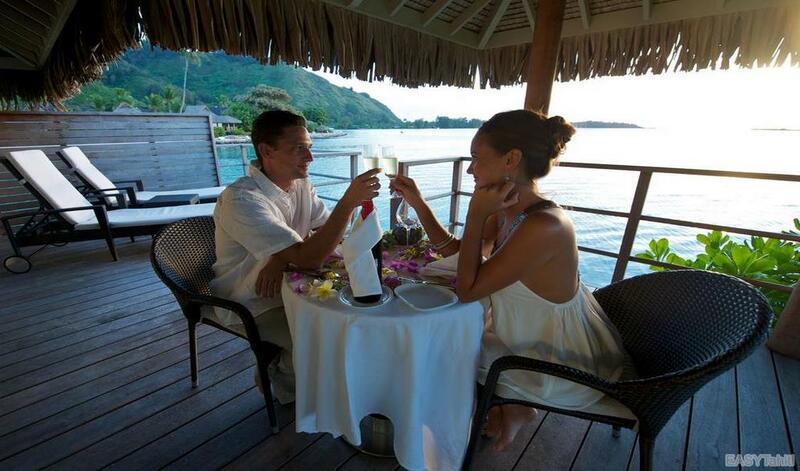 It is the perfect place to enjoy the lagoon view, the beautiful sunsets while enjoying exotic cocktails. Local and international music. The Motu One bar, the hotel's in-house bar, serves snacks and light salads. It is open from 8:00am to 10:30pm for the drinks service and from 11:30am to 8:00pm for lunch and dinner. Room Service, open from 6.30am to 9.30pm. - Free access to 2 lighted tennis courts. - Artisanal and cultural demonstrations. 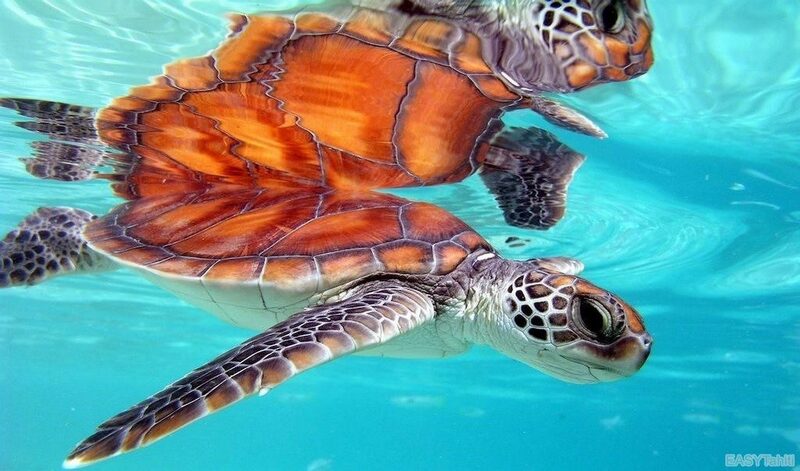 - The Turtle Care Center was established in February 2004. 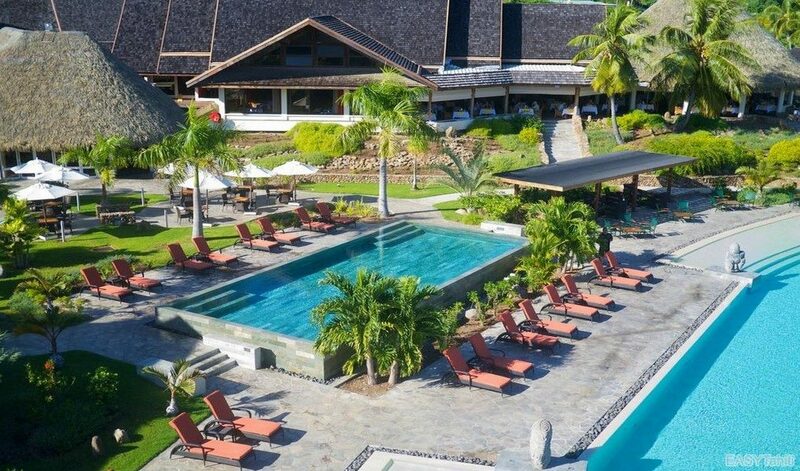 The InterContinental Moorea Resort & Spa, involved in saving sea turtles, has agreed to develop part of its lagoon to accommodate turtles. 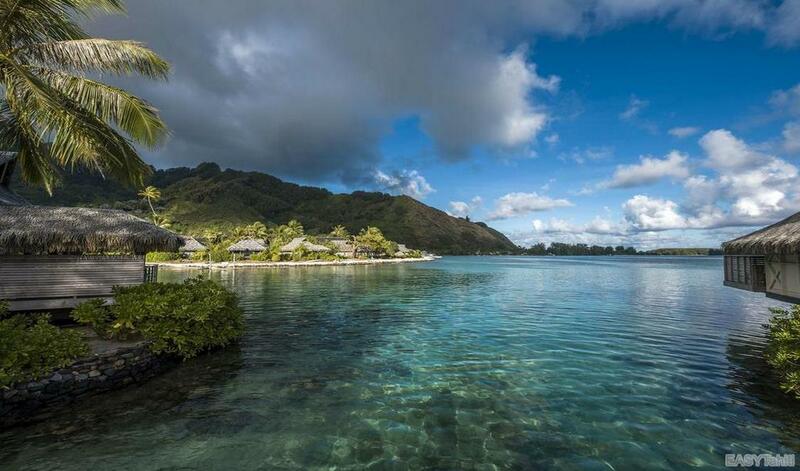 The hotel entrusted the management of the marine turtle care center to the association "te mana o te moana". 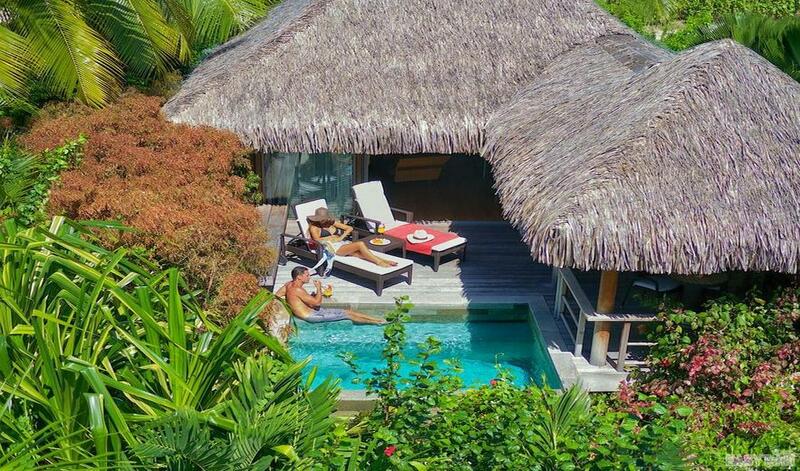 - The Hélène 'Spa, open on a beautiful tropical environment, offers a rich program of traditional and ancestral Polynesian treatments. Perfect for a moment of pure relaxation. - The Moorea Dolphin Center has been offering educational and interactive programs with its dolphins for more than 20 years to give the public the opportunity to better understand these fascinating mammals by discovering them closely with the utmost respect. 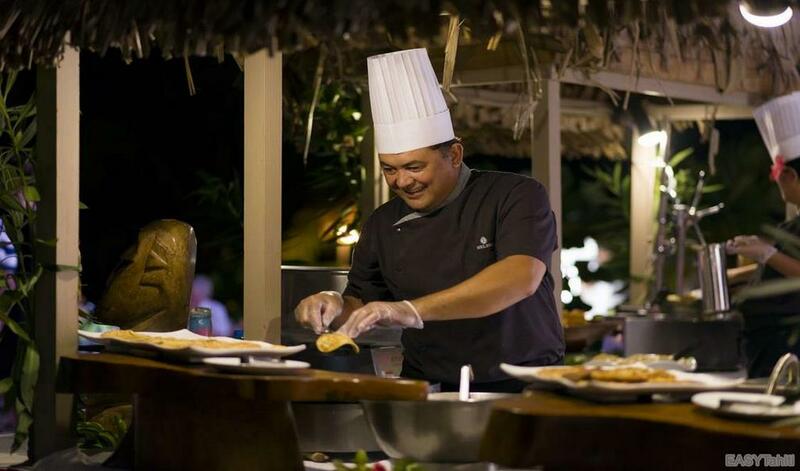 To ensure a competitive rate and minimize downtime, you can get in touch with your EASYTahiti Travel Consultant to organize your activity plan in advance. They are comfortable and spacious, measuring 323 sq ft (30 sq m) excluding terraces or balconies that give on to the luxuriant resort gardens. They all have king size beds that may be separated as two twin beds. Cable TV, direct international telephone line, personal safe, mini-bar, 110V/220V plugs, tea & coffee making facilities, ironing board & iron, bathroom amenities, hairdryer. • Private terrace with teak table and chairs. • Sheers and blackout drapes. 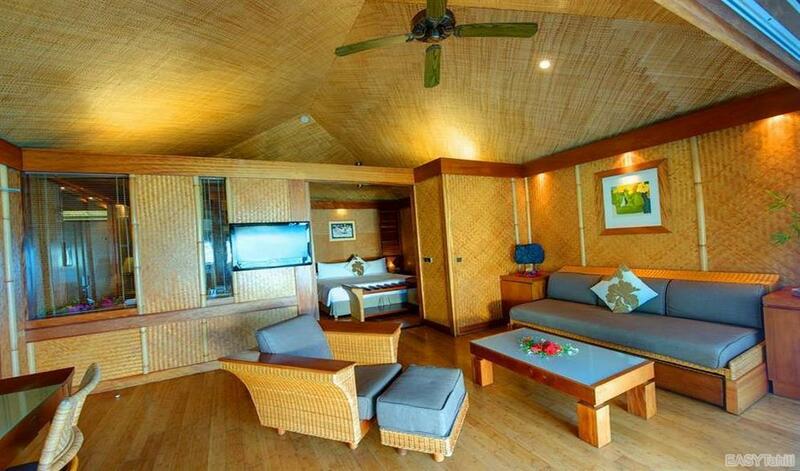 • Individually controlled air conditioning (one only) and ceiling fans (two) in both bedroom and lounge area. • Complimentary tea & coffee facilities. • Next day laundry and pressing (no dry cleaning facility on the island). • TV (local & international channels including CNN). and lobby area by WIFI. • 110 v bathroom outlet (standard is 220 v). 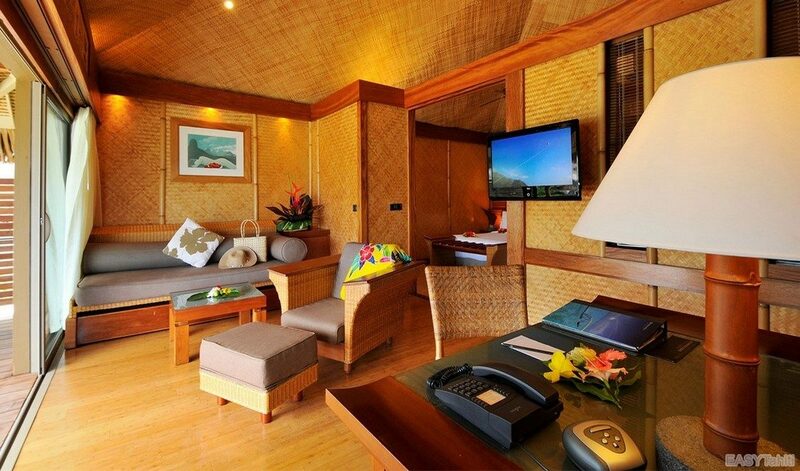 There are 17 of these garden bungalows suites are dotted throughout the beautiful and fragrant gardens. They measure 409 sq ft (38 sq m) without counting their terrace. Beds are king size and there's a convertible sofa bed in the lounge area. Max 3 adults or 2 adults + 2 children (under 12). • Next day laundr y and pressing (no dr y cleaning facility on the island). • ADSL high speed internet connection in the business centre and lobby area by WIFI. 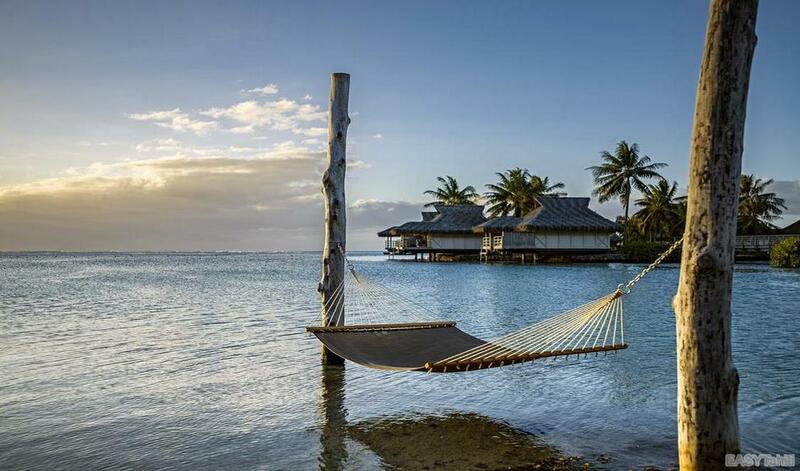 These 28 beach bungalows are situated on a white sand beach gently sloping into the lagoon, under the shade of the coconut trees. They are of 409 sq ft (38 sq m) size, excluding their terraces. All have king size beds, and convertible sofa beds in their lounge areas. 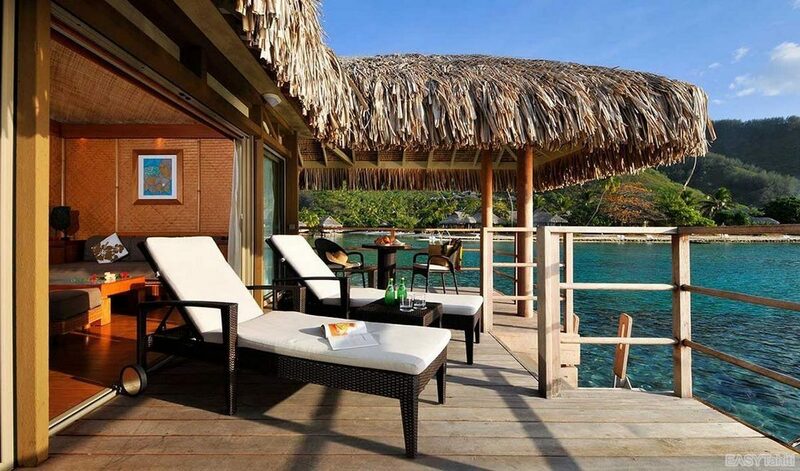 These suite bungalows are beach premiums due to their more isolated location. Otherwise they have the same features then the beach bungalows. 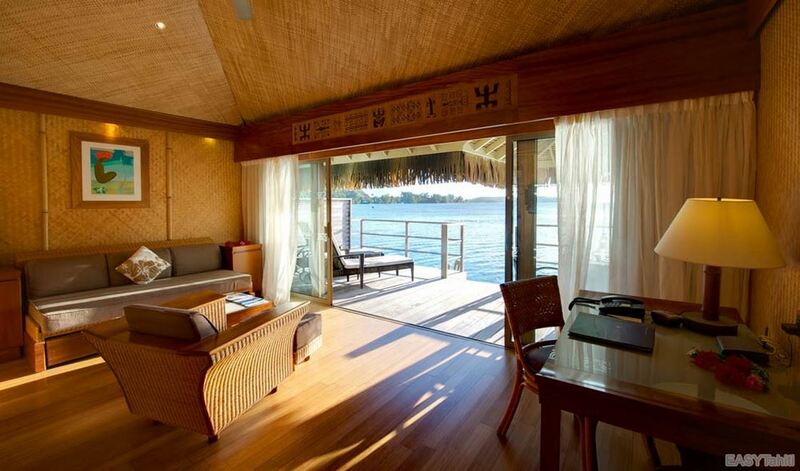 The 50 overwater bungalows are around a series of green islands (motu in Tahitian). They are our largest bungalows, measuring a ver y spacious 452 sq ft (42 sq m) without counting the terrace. All suites have king size beds and conver tible sofa-beds. 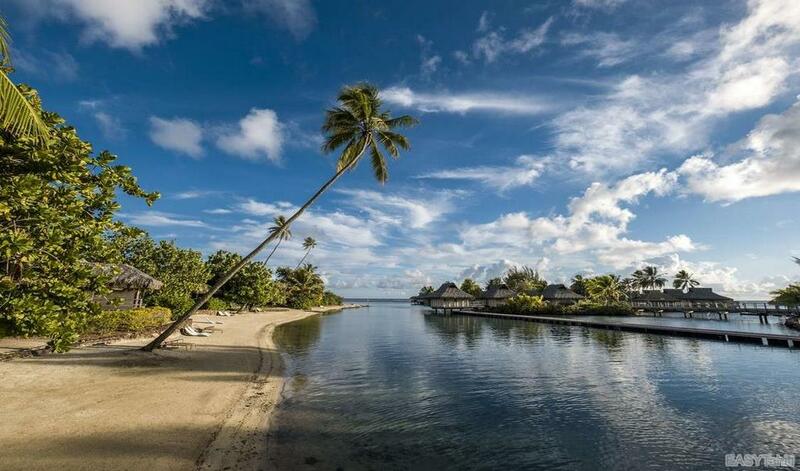 From the private terraces you have direct access into the lagoon for swimming. Cable TV, direct international telephone line, personal safe, mini-bar, 110V/220V plugs, tea & coffee making facilities, ironing board & iron, bathroom amenities, hairdryer. Max 3 adults or 2 adults + 2 children (under 12). 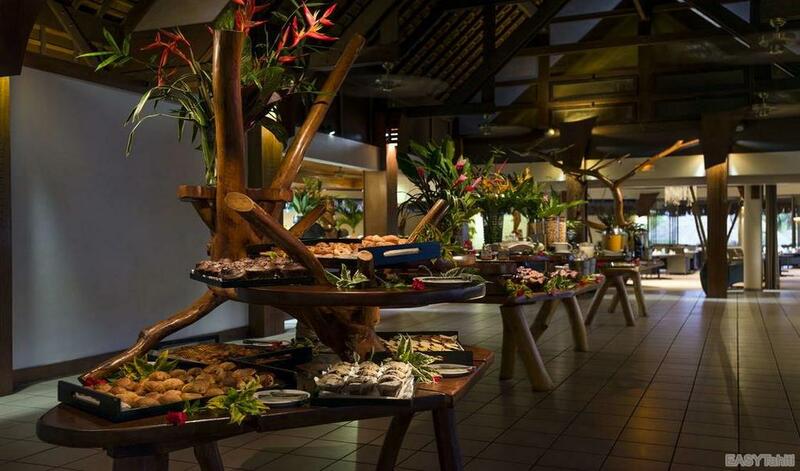 • Breakfast delivered by outrigger canoe (special order). 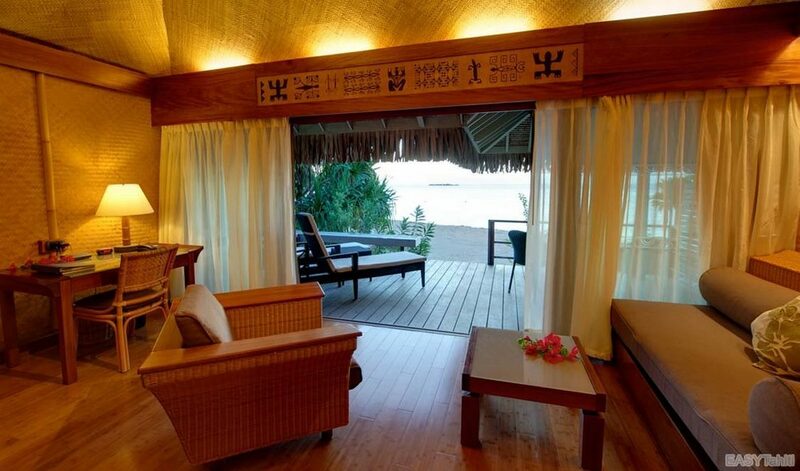 Among the Overwater Bungalows, 29 are Premiums. 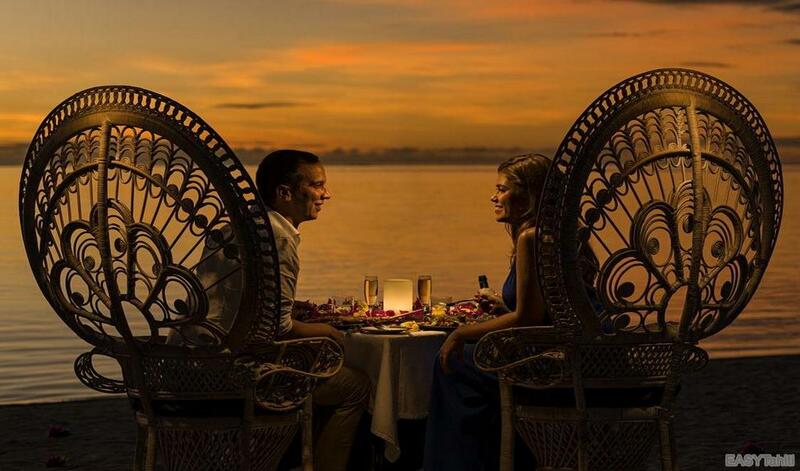 Their optimal location ensures a quiet atmosphere and have unobstructed views of the lagoon and the horizon. 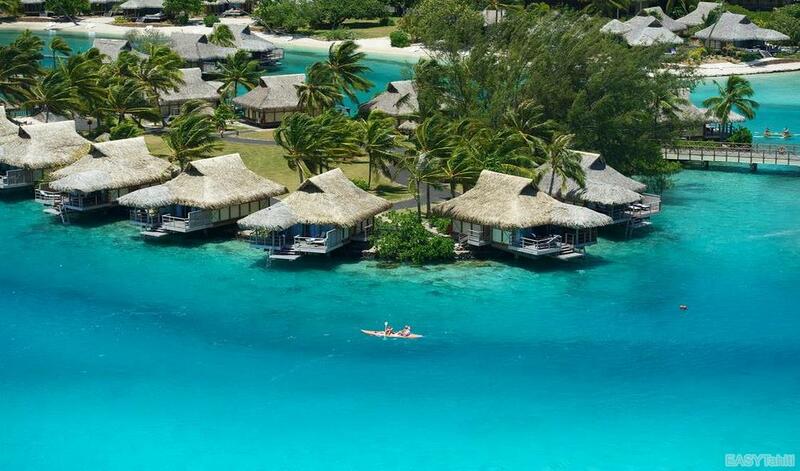 Ohterwise these are entirely similar to Overwater Bungalows. In the main hotel building. It is closer to the central core of resort facilities. They are comfortable and spacious, measuring 60m2 excluding terraces or balconies that give on the luxuriant resort gardens. A unit that is double the size of the standard rooms with an additional balcony, furnished with loungers. It has double beds that may be seperated as two twin beds and a lounge with 2 sofa beds. 2 TV with cable, international direct téléphone, 2 radios, personal safe, kitchenette, mini-bar and fridge, 110v & 220v plugs, hairdryer, ironing board and iron, bathroom amenities, tea & coffe making facilities.